Racegoers made their way to the Grand National amid a 24-hour strike by workers from three rail companies. The action, involving Southern, Merseyrail and Arriva Rail North, is part of an ongoing dispute over staffing and the role of conductors. Merseyrail said choosing to strike on the day of the race meeting would "do immeasurable damage" to Liverpool's reputation. The RMT union said its members "wanted to make the loudest voice possible". RMT north west regional organiser John Tilley said drivers who are members of the Aslef union have also "refused to cross the picket line". Merseyrail said services between Liverpool and Aintree will operate every seven-and-a-half minutes "at key times" throughout the day, with fewer or no trains at other times. It drafted in a team of managers to provide a service before and after the race, which takes place at 17:15 BST - 15 minutes before the afternoon replacement services begin. Speaking after failed talks with the RMT union, Merseyrail managing director Jan Chaudhry-van der Velde said the "eyes of the world" would be on Liverpool during the Aintree event. Merseyrail carries an extra 20,000 passengers to and from Aintree on Grand National day. Passengers are being handed leaflets about changes to services. One rail user, @robynjessicaaaa from Liverpool, tweeted it had taken her two hours to get to work instead of the usual 15 minutes. 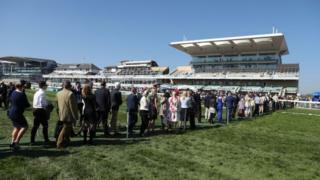 A woman who travelled from the Netherlands for the Grand National told BBC Radio Merseyside: "We were a bit surprised and a bit afraid that we couldn't get here. "But we are here and everything is perfectly organised and we are all very happy." Another racegoer from Southport said: "The service was perfect. We've had no issues whatsoever." The RMT unveiled a mobile advertising billboard to explain the reasons for the strike to racegoers. Mr Tilley said: "The strike is rock solid. There is not a single member who has gone in. "There is not a single member of the driving grade in the Aslef union gone in, they've all refused to cross the picket line. "It's a serious business... Our members wanted to make the loudest voice possible." RMT members are opposed to plans to introduce driver-only-operated trains, which they say would be unsafe and lead to widespread job losses. The union said on Northern, the trading name of Arriva Rail North, the proposal is to take guards off 50% of its services, on Merseyrail it is 100%. Speaking outside Leeds train station earlier, Sean McGowan, RMT regional organiser, said: "We think moving to a driver-only operation service is an absolute recipe for disaster." Rail strike: What are driver-only-operated trains? Mr Chaudhry-van der Velde said: "Despite the RMT's best efforts to scupper this iconic event and create misery for the tens of thousands of people who look forward to it all year, we've developed a timetable aimed at getting as many people between central Liverpool and Aintree as we normally do on Grand National day." Nigel Smith, chief executive of Tourism South East, said: "People will either abandon that trip because there's no, or limited, rail services. "Events like the Brighton Marathon which happens this weekend is worth in the region of £5-6 million to the town. Around 80% of the runners usually come from outside the Brighton area, and probably quite a few from London are likely to be travelling on the train." Rail Minister Paul Maynard said it was "disappointing" the strike was going ahead and urged the RMT to return to talks. He said Northern was in the early stages of work to deliver the improvements passengers have asked for. Merseyrail has drawn up a contingency train timetable to combat the strike action, with the replacement timetable in place between 11:15 and 13:30 and then between 17:30 and 19:15. There will be fewer trains or no trains at all on other parts of the network, although replacement buses will run on certain lines. Arriva Rail North added six trains to its Liverpool Lime Street service to help racegoers travel home. Richard Allan, Northern's deputy manager director, said: "Services on many routes will wind down from late afternoon onwards, with very few trains running after 7pm." Southern also said it would also be operating a reduced service along some lines with the operator hoping to run 90% of its timetable. The date was moved from 4 April to coincide with strikes on the same issue at Merseyrail and Northern. Up to 2,000 staff at Southern rail, Merseyrail and Northern rail walked out on 13 March in the ongoing dispute but only limited disruption was reported. Video The RMT union is opposing plans to make trains driver-only-operated.